You are so right about the salad and cold weather – I am guilty of this mistake, for some reason… I tend to reserve soup for winter and salad for summer. 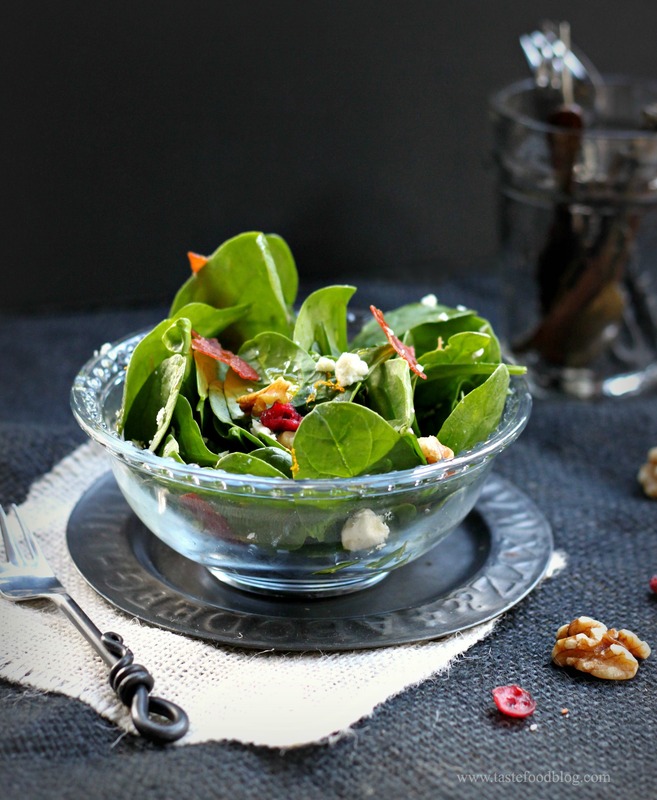 beautiful salad, perfect flavors for the cooler weather…. So true – even as I post this, I have soup simmering on the stove. What a beautiful ode to fall salads, and I completely agree. These are some of my favorite salads. Gorgeous photography here. I have a hard time photographing salads and you’ve made this one look irresistable! A beautiful salad! This is one mouthwatering combination. Fresh spinach is a perfect green for fall, with a touch more texture it has more heft than the carefree salads of summer. An enticing idea for dinner, especially with goat cheese and crispy prosciutto! I make the same old salad night after night, I need to shake things up a bit with a beauty like this one. Delicious combination of flavours! Mmm goat’s cheese.